Thu, Apr 18, 2019, 17:11:08 ---- The fact: 42.844.000 visitors done. A radically new automated tube bending cell has been developed by Unison. 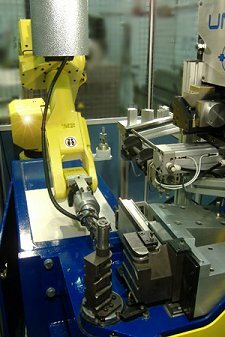 It provides a complete end-to-end loading/end-forming/bending and vision inspection process in the footprint typically required for a standalone tube-bending machine. Called Uni-vercell, its innovative, all-electric machine architecture centred on an articulated robot arm breaks new ground in terms of performance and compactness.